Nengyong was 31 years old and married with four children. 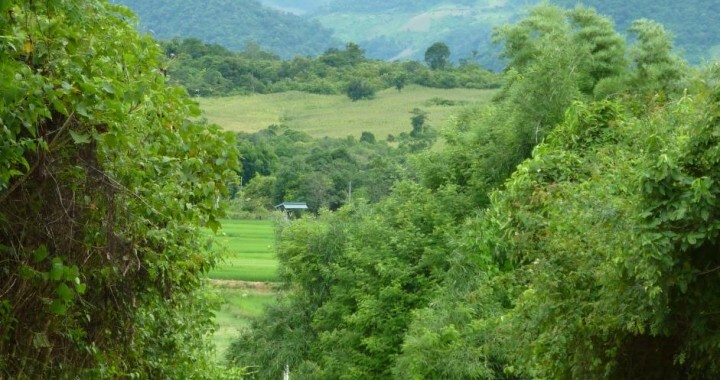 In April 2012, Nengyong was cutting a tree in his field in preparation for planting corn when he hit a UXO that had been sitting inside the tree trunk for decades. 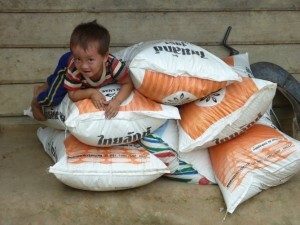 As a result of the accident Nengyong lost his sight. He was treated in hospital for several weeks. Nengyong’s wife Mai Khang told QLA that since the accident he had been very upset because he was blind and could not farm or support his family. He told her that dying would be better than having to rely on her to take care of him. In June 2012 Nengyong killed himself. Mai Khang woke up to find that he was not in bed. She searched through the house and then went outside to find that he had hanged himself from a mango tree. Although she immediately cut him down and cried out to the neighbors for help, he was already beyond help. 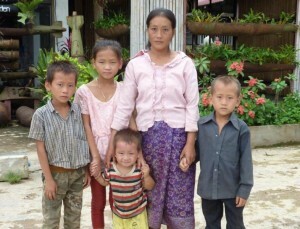 Nengyong left behind three young sons and one daughter. Although there is no way to undo this tragedy, QLA will continue to have contact with Nengyong’s family and endeavour to assist as much as possible. 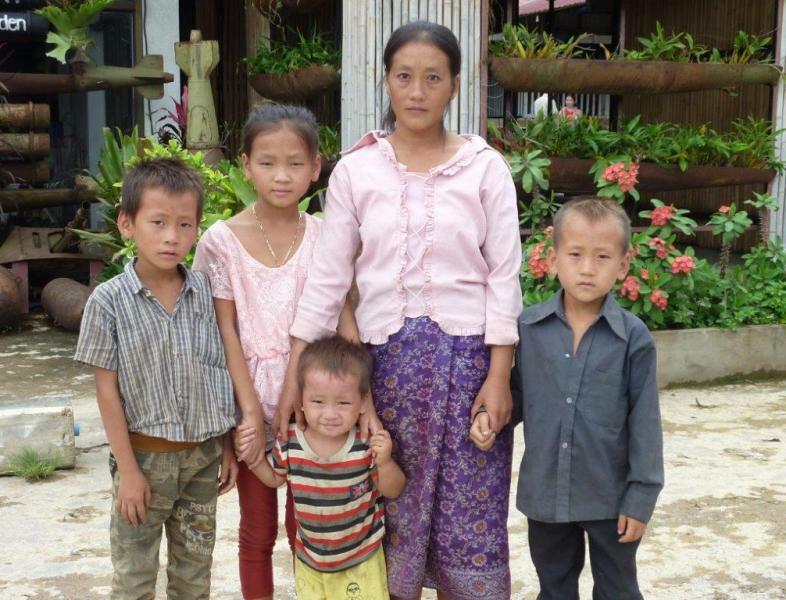 After Nengyong passed away, MaiKhang had to stay home and care for her children, so QLa arranged for her brother-in-law to attend animal raising training on her behalf in June 2013. 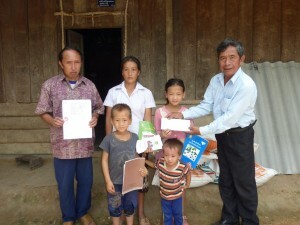 QLA provided a small grant to buy animals for raising and MaiKhang opted to buy some chickens. MaiKhang now has 30 chickens and 40 chicks which can be sold or used at Basi ceremonies (significant religious/spiritual events). This shows that MaiKhang has made good use of the previous small grant. In response to reading Nengyong’s story, QLA received a private donation from a family that wanted to help this family specifically. QLA met with MaiKhang to determine the needs of her and her children. In August 2014 QLA arranged the purchase of school uniforms, shoes and school books for the three children of school age and the payment of school fees. MaiKhang’s roof was in such a state of disrepair that the kitchen was unusable. QLA arranged for the purchase of roofing materials and several members of MaiKhang’s extended family assisted with putting on the new roof within one week of purchase. QLA also provided a grant for MaiKhang to buy two pigs, to generate income and a few bags of rice so she could feed her family until income from the pigs was realised. MaiKhang is very thankful for the assistance that QLA has given and said that now the essential things that were worrying her have been taken care of, she hopes that life will be easier for her and her children. She also said she would like to see QLA provide this type of assistance to other families of UXO survivors and UXO victims. The donating family has indicated that if the children attend school regularly and receive a good school report they will consider funding the education costs again next year and in subsequent years. The Yang family’s visit to Phonsavan to buy school uniforms and shoes. From left: Souk (10yrs) DouaOng (12 yrs), YengJouk (2yrs), MaiKhang (32 yrs) and KaLai (8 yrs). YengJouk inspects the quality of the rice! Khamkhone, President of QLA’s Board of Directors, hands over the school books, rice, roofing materials and funds for education and the purchase of 2 pigs to the Yang family. The Head of the village (left) supervised the event. The oldest boy, Souk, was at his grandmother’s that day. Channapha Khamvongsa (Legacies of War) has been a tireless advocate for UXO victims for many years. 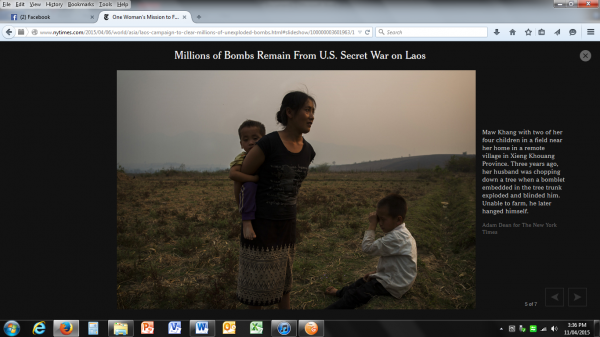 When in Xieng Khouang during her visit to Laos from the USA, QLA introduced Channapha to Mai Khang in March 2015 after which Channapha’s advocacy work was a feature article in the International New York Times and Mai Khang’s story was one of several included in the article. Posted in UXO stories and tagged animal raising training, generate income, UXO.